OV7670 image sensor, small size, low operating voltage, and provides all the features of the single-chip VGA camera and image processor. The OV7670 is a low cost image sensor + DSP that can operate at a maximum of 30 fps and 640 x 480 ("VGA") resolutions, equivalent to 0.3 Megapixels. The captured image can be pre-processed by the DSP before sending it out. This preprocessing can be configured via the Serial Camera Control Bus (SCCB). You can see the full datasheet here. There are many camera modules, that come with standard 0.1" spaced headers, in eBay with prices under $10. I'll be using the one shown below, it comes WITHOUT a FIFO buffer. Now, I'll cover the meaning of these pins. **A note about supply voltage and I/O voltage. VDDA can range from 2.45V to 3.00V. VDDC can range from 1.62V to 1.98V. VDDIO can range from 1.7V to 3.00V. You can (hopefully) see here (sorry, it's buried among other files) the schematic of the model I'm using in this post. As you can see U1 and U2 are LDO regulators, one is a 2.8V regulator for VDDA and VDDIO and the other is a 1.8V regulator for VDDC. The actual regulator that gets soldered on the module seems to vary between modules. You can safely use a maximum of 3.0V for the I/O pins. However the module I/O pins will work at 2.8V. A 5V supply for the OV7670 VDD might work (try at your own risk), it depends on the maximum input voltage of the LDO regulators your module has. Before going into the signaling, it's necessary to understand how video and images are representend in digital format. A video is a succession of frames, a frame is a still image taken at an instant of time. A frame is compromised of lines, and a line is compromised of pixels. A pixel is the smallest part of a digital image, and it looks like a colored dot. For example, the image above has 5 lines, and each line has 5 pixels. This means the image has a resolution of 5x5 pixels. This image is monochrome, there are also color image. This color can be encoded in various formats, in the next section we'll cover the most relevant formats for the OV7670. In monochromes images, each pixel is stored as 8 bits, representing gray scale levels from 0 to 255. Where 0 is black, 255 is white and the intermediate values are grays. Is a fact that any color can be decomposed in red, green and blue light at different intensities. This approach is known as the RGB color model. 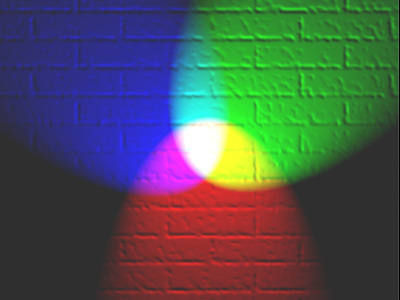 Using this model, each pixel must be stored as three intensities of these red, green and blue lights. RGB color model. Image from wikipedia. The most common format is RGB888, in this format each pixel is stored in 24 bits, the red, green and blue channels are stored in 8 bits each. This means that the intensity of each light can go from 0 to 255, where 0 is the absence of light, and 255 is the maximum intensity. The formats used by the OV7670 are the RGB565, RGB555 and RGB444. The difference with the RGB888 format, is the number of bits assigned to each channel. For example, in the RGB565 format, the red channel is stored as 5 bits, the green channel as 6 bits and the blue channel as 5 bits. These formats take less memory when stored but in exchange sacrifice the number of colors available. YCbCr is a format in which a RGB color can be encoded. The Y or luminance component is the amount of white light of a color, and the Cb and Cr are the chroma components, which respectly encode the blue and red levels relative to the luminance component. Decomposition of an image into its Y, Cb and Cr components. Image from wikipedia. As you can see the Y channel encodes the gray scale levels of the image. Therefore, the easiest way to get a monochrome image from the OV7670 is to extract the Y channel of the YCbCr format. As the RGB format, the YCbCr also stores each channel as 8 bits (from 0 to 255) and we can convert from YCbCr to RGB using the following expression. Notice each pixel is 3 byte long (e.g. Y0, Cb0 and Cr0), as in the RGB format. But, in the YCbCr422 format, the Cb and Cr channels are shared between two consecutive pixels (e.g. pixels 0 and 1 share Cb0 and Cr0). Therefore two pixels are "compressed" into 4 bytes or 32 bits, this means that in average each pixel is stored as 2 bytes or 16 bits. From the example above, 3 words (12 bytes) store 6 pixels. The extra advantage of YCbCr is that the Y channel is the grayscale image, whereas in RGB you'll need to average the 3 channels to get the grayscale image. The OV7670 sends the data in a parallel synchronous format. First of all, to get any data out of the OV7670, is necessary to supply a clock signal on the XCLK pin. According to the datasheet, this clock must have a frequency between 10 and 48 MHz. However, I have successfully used a 8 MHz clock with some configuration via the SCCB. If you are using a microcontroller that has clock output, you can use that to clock the OV7670, these can generally output their inner system clock prescaled by some factor. If your microcontroller doesn't have clock output capability, but you're using an external crystal, then you can connect the OSC_OUT pin to the OV7670. After a clock signal has been applied to the XCLK pin, the OV7670 will start driving its VSYNC, HREF and D0-D7 pins. Let's take a look at these signals. First thing to notice, the D0-D7 must be sampled at the rising edge of the PCLK signal. Number two, D0-D7 must be sampled only when HREF is high. Also, the rising edge of HREF signals the start of a line, and the falling edge of HREF signals the end of the line. All these bytes sampled when HREF was high, correspond to the pixels in one line. Note that one byte is not a pixel, it depends on the format chosen. By default, the format is YCbCr422, this means that in average two bytes correspond to a pixel. The image above shows the signals for a "VGA" (640 x 480) frame. During HSYNC high state, we must capture 640 pixels, equivalent to a line. The 480 lines, equivalent to a frame, are captured during the low state of VSYNC. This means that the falling edge of VSYNC signals the start of a frame, and its rising edge signals the end of a frame. That covers all the process of obtaining one frame, the remaining question is how fast are frames sent. By default, the PCLK will have the same frequency of XCLK, however prescalers and PPLs can be configured using the SCCB, to produce a PCLK of different frequency. A PCLK of 24 MHz will produce 30 fps, a PCLK of 12 MHz will produce 15 fps and so on. All this is independent of the format of the image (VGA, CIF, QCIF, etc). What makes the OV7670 so versatile is its inner DSP, that can pre-process the image before its sent. This DSP can be accessed via a SCCB interface. This SCCB protocol is very similar to the I2C protocol. You can see the SCCB specification here. I couldn't get my STM32 microcontroller's I2C module to work with the OV7670's SCCB interface, so I implemented a bit bang version of the SCCB specification. This implementation is my peripheral librarylibstm32pp. After making sure the SCCB is working, we can tweak the OV7670. To change the frames per second (fps), we need to change the frequency of PCLK. And for that we need to modify the following registers via the SCCB. Now that you know the involved registers, the process is straightforward. For example, say we have a 8 MHz input clock and we want a 24 MHz PCLK. The only possible configuration is prescaler by 2, and PLL x6. CLKRC Bit must be 0, to enable prescaler. CLKRC Bit[0-5] must be 1, to enable prescaler by 2. Of course, the OV7670 utilizes the VGA design, on the off chance that you need to do picture preparing on a microcontroller with the OV7670 yield, this might be an excessive amount of information, and you may need the QCIF arrange. To change the arrangement we have to adjust the accompanying registers.